By seeing, discussing and experiencing art, students begin to see the world a little differently. At Elm Street School, our Disciplined Based Art Education becomes the standard for creating a new awareness. This four-part system includes creative endeavor (the making of art), art history, aesthetics (the philosophy of art), and art criticism. At the elementary level we spend the greatest amount of time on the art-making aspect of our lessons, but art history, criticism and aesthetics are included in some part of all that we do. 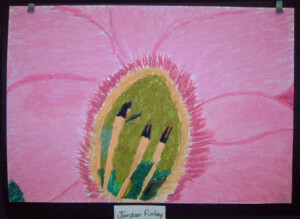 In addition, we do not teach the elements and principles of art separately, but embed them into each lesson or unit. Principles such as color, movement, and shape are woven together in each lesson, such as in our unit of Georgia O’Keefe and Modernism, where color theory, organic line and shape, and balance are studied in the process of creating pieces of art in her style.